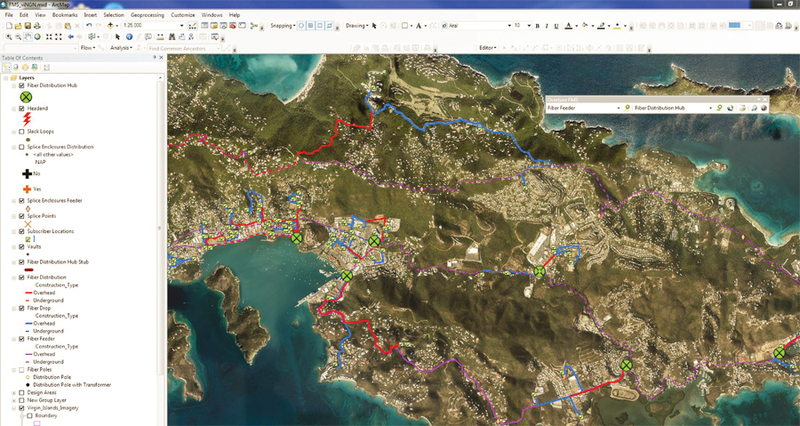 Designing the Virgin Islands Next Generation Network (viNGN) fiber network using ArcGIS for Desktop. Although separated by almost 1,500 miles, the City of Wilson, North Carolina, and St. Thomas in the US Virgin Islands use the GIS-based solutions to bring high bandwidth service to homes or businesses. City of Wilson is proud to call itself North Carolina’s First Gigabit City. It offers ultrahigh-speed Internet, voice, and video at affordable rates to its residents. Greenlight Community Broadband (Greenlight), North Carolina’s community-owned Fiber to the Home (FTTH) network, makes this possible. According to Will Aycock, general manager at Greenlight, “Our whole operation is about two things—customer service and efficiency.” Aycock noticed that the number of service trucks dispatched was at an all-time high. Greenlight needed a way to monitor all daily work orders. Aycock, a former GIS coordinator who was familiar with Esri technology, knew that he needed a way to make it easier to group field service calls geographically so field technicians could work more efficiently. For mapping and data integration, Greenlight chose Overture GIS, which uses ArcGIS for Server, ArcGIS for Desktop, and ArcGIS Online. Overture GIS provides comprehensive network and the real-time status of all service calls. All service calls and vehicle tracking data are displayed on a map, and service calls can be grouped by region to optimize routing and reduce travel time. Subscribers and their services are also displayed on a map so sales trends can be tracked at the neighborhood, city, and region levels. This information helps decision makers and benefits sales and marketing teams. When the network needs to be expanded, users can design new fiber network infrastructure for the City of Wilson, North Carolina. The web application and business intelligence solution transformed Greenlight’s telecom data warehouse into a full-blown command center and monitoring system. At the core is Esri GIS technology, which Greenlight relies on to tap into any existing data, streamline processes, build custom reports, display critical data via a dashboard for the leadership teams, manage its work force, and increase efficiency across all departments. The Virgin Islands Next Generation Network (viNGN), headquartered in St. Thomas, was established in 2010 to provide all Virgin Islands residents with fast, reliable Internet service. This network’s goal is to connect the Virgin Islands to the rest of the world. viNGN manages a territory-wide high-speed middle mile fiber-optic network [portion of the network between the greater Internet and the last mile or direct connection to the customer] that delivers broadband service. It was looking for a fiber management system (FMS) that could be used to not only engineer, map, and maintain a fiber network but also handle inventory and work order management subsystems. It would be a single platform solution that could prevent costly data conversions in the future. The Esri-based technology fulfilled viNGN’s operational objective of integrating base fiber design drawings previously created in ArcMap into the system and enabling fiber assignment review. Overture FMS, integrated with viNGN’s OSS/BSS database from ETI Software, supported viNGN’s optical-based Carrier Ethernet network. viNGN can now import new customer records and export fiber assignment queries to the OSS/BSS solution, eliminating dual entry and costly data conversions. At the heart of this technology lies Esri’s ArcGIS for Desktop. The tool utilizes existing ArcGIS technology and incorporates an easy-to-use interface so engineers and managers can create new design areas and edit existing infrastructure. Because viNGN uses an industry-standard geodatabase model, engineers and managers can manage, track, and view outside plant data. Working with viNGN and an Esri toolset, the project team digitized the existing fiber network CAD data for the three US Virgin Islands using Overture FMS. By incorporating data contained in the splice matrixes and the naming schema recommended for the geodatabase, the viNGN network can now be viewed and managed in an organized and logical manner. Since viNGN already had Esri licenses for ArcGIS for Server and ArcGIS for Desktop, the team’s next task was to travel on-site and train the viNGN personnel. Three days of training and system configuration ensured success moving forward. As viNGN expands to provide more services to the islands, it will continue to improve efficiency, make better management decisions, and optimize performance and revenue. Bringing fiber networks to the home or premises is becoming a reality across the globe. Communities, cities, and countries are investing in their economic and social future by bringing fiber networks closer to the end user. Managing these networks in a logical and geographic manner brings business intelligence to them. For more information, contact David Holdstock, CEO, Geographic Technologies Group or Brad Hine, product manager, ETI Software Solutions.